When it comes to what makes the Rotman School such a terrific place to study, rankings and academic excellence are only part of the story. Life at Rotman is defined by the dynamism and creativity of the students, faculty and staff that call the School home. At Rotman, the school never sleeps. Everywhere you look students, staff, faculty, alumni, corporate partners, and the university community at large are intensely focused on their work. At the same time, there is no shortage of fun and always someone to turn to for help. Join us, it is a great place to be. Ever wonder what it's really like to be a Rotman MBA student? Check out these current student blogs for the inside scoop. 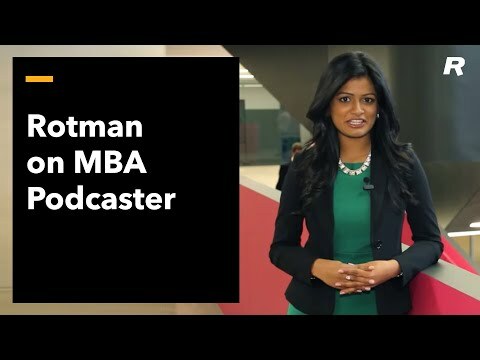 From interview preparation to cramming for exams to blowing off steam with fellow students, get an early glimpse of the transformational experience that awaits you in the Rotman MBA program. Rotman ambassadors are current students who have generously volunteered their time to help you make your MBA decision. They also help those on track to study with us feel comfortable and prepared for what lies ahead. Contact us to arrange to speak with an ambassador or to come for a class visit. Read their bios to find the ambassador who is the best fit for your application questions. International study tours are designed to help MBA students understand the opportunities and risks associated with the emergence of important markets in the world economy. They are one of a range of opportunities that help our students to gain international experience while at Rotman. The range and diversity of student clubs available to Rotman students is remarkable. Whether your goal is to grow your network, build your skills, or just enjoy a good time with your classmates, we have a club for you. Rotman Onboard matches talented upper-year MBA candidates with non-profit boards and charities for eight-month fellowships. OnBoard fellows work closely with a board mentor to complete a strategic governance project based on the organization’s needs. CityLab offers a unique, hands-on learning experience – and the opportunity to tackle a real-world urban challenge. Over eight months, students partner with local organizations to stimulate social and economic activity at the neighbourhood level. Convocation is a special event that brings together graduates and members of the Rotman School. For graduating students, it is a significant milestone, a time to celebrate their accomplishments in front of family and friends. A Rotman degree has been described as a master key that opens many doors. Meet some of our recent grads and the first roles they had after graduation. Learn how the Rotman School helped them achieve their personal and professional best. The Rotman School is in downtown Toronto, Canada’s financial, commercial and cultural capital, consistently ranked one of the best cities in the world in which to live. Our students are trained just blocks from Bay Street (Canada’s business centre), and the School takes full advantage of its location: a variety of academic and research partnerships exist between Rotman and the corporate world. Established in 1827, the University of Toronto is recognized worldwide as Canada’s top research university, a reputation that will add value for students who aspire to careers with global dimensions. As a Rotman student, you are welcome everywhere on the beautiful and historic U of T campus. Explore the first-class athletic facilities, the fourth-largest research library in North America, and a range of dining choices.